Please join the Methow Conservancy in celebrating the people and land that makes the Methow Valley so special! Everyone is invited to the Conservancy’s annual holiday social from 6 – 7pm. Enjoy free appetizers and holiday punch, and purchase beer or wine if you’d like. Before the 1st Tuesday program, we’ll honor community members with our annual conservation awards. It’s our time to thank you for all that you help us do – please join us! The Methow Conservancy’s annual year-end community program and social on Tuesday, December 1st at the Winthrop Barn will feature renowned marine scientists and writers, Audrey DeLella Benedict and Joe Gaydos, for an ecological adventure to the Salish Sea. When you call the Pacific Northwest home, even on the east-side of the Cascades in the Methow Valley, you know how important the coastal waters are to the diversity of wildlife and human culture that call this special corner of the world home. From salmon to snow, and mudflats to forests, the connection between the Methow Valley and the islands and ocean water of the Salish Sea is not simply cross-cultural but ecologically important too. The Salish Sea region is an ecological jewel straddling the western border between Canada and the United States, connected to the Pacific Ocean primarily through the Strait of Juan de Fuca. There, lush and mossy old-growth forests meet waters with dazzlingly-colored anemones and majestic orcas. Audrey and Joseph’s program is based on the beautiful book they recently co-wrote, “The Salish Sea: Jewel of the Pacific Northwest.” The eye-opening program is rich with dramatic photograph, lively stories and, of course, a scientist’s inquiring mind. The Salish Sea, whose name was not officially recognized until 2008, is one of the world’s largest inland seas. It contains 6,535 square miles of sea surface area and 4,642 miles of coastline. 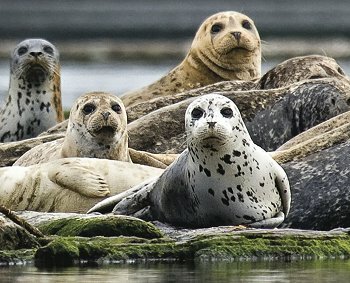 Fashioned by the violent volcanism of the Pacific Rim of Fire, plate tectonics, and the sculptural magic wrought by Ice Age glaciers, the Salish Sea is a unique ecosystem home to thousands of different species of mammals, birds, fish, reptiles, and macro-invertebrates. Join us for a fascinating look at the Salish Sea’s geology, fauna, and history, and learn about what’s being done to protect its future, and why it matters to us in the Methow. No RSVPs are needed. Contact the Methow Conservancy at 996-2870, mary@methowconservancy.org if you have questions.